Posted on 20 September 2013. 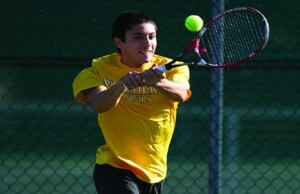 The Wooster tennis teams are off to a promising start after playing well in invitational matches this past weekend. Seven women won at the Oberlin Invitational, giving the team hope for the upcoming season. The men also started their season strongly at the Kenyon Invitational with a handful of victories. The women’s tennis team won a little under half of its matches last season, but they have gradually made progress over the course of the season and are looking to continue their growth in the 2013-14 season. “We are a pretty young team and because of this we have a lot of room for growth, especially with the three freshmen,” said Catherine Christian ’16. The women’s team has shown previous opponents that Wooster tennis is anything but an easy adversary. Rachel Appleton ’14 anticipates a change of attitude from competitors after last year, when the team moved up two spots in the NCAA rankings and earned its best record at Hilton Head in 15 years. Another key to the success of the women’s tennis team this year is the chemistry that exists between all of its members. Chemistry is a vital part of any team’s success, and the number of young players on the women’s squad makes it important for the team to bond quickly. As expressed by both Appleton and Christian, the team is young; over half of the team is made up of underclassmen. Christian and Rose Chiumento ‘16, who are sure to be key returning players this upcoming season, will play a very important role leading the team. The Wooster men’s tennis team also looks promising for the upcoming season, with new head coach Tim Dunford and a solid group of freshmen. Although last year the team only won about a quarter of their matches, they are up against tough teams in their conference. The freshmen also bring hope to the team with their talent and drive. Davis Elkins ’17 and Jack Buchan ’17 have started off their college careers strongly with a decisive win in the “C Doubles” championship at the Kenyon College Invitational. The duo is expected to produce more great results as the season progresses. Aside from a new coach and competitive freshmen, there are a handful of returning players that are looking to lead the 2013-14 tennis team. “Key players would be Willy Nelson and Milo Saurman [’16], as they are our top players for singles and doubles,” said teammate Tripp McLane ’15. McLane and Appleton both explained that the teams are tightly knit groups, which creates a positive and competitive environment. Both are hoping this closeness will help them grow and develop toward a successful season. Anna Regan - who has written 316 posts on The Wooster Voice.